Description: Westbound Moving Past MP1384 On Kootenai River Subdivision. Title: BNSF 647 on NS#387 at Rives Rd. Description: Patched and fading warbonnet. Description: parked out side town for a crew change. Description: Looking out over Greenland. 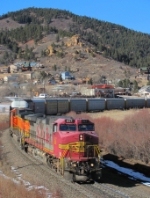 Title: BNSF's Provo-Denver ''Q'' Train Ironton,Utah November 13,2010. Description: BNSF's daily Q-PVDV-J performs a running air test before leaving Provo for the mile high city with three schemes representing the modern BNSF.